24k gold plated cone shape filter for specialty coffee brewing. It is designed to achieve fast extraction using high water temperature to extract good quality acidity. C275 Gold Cone Filter comes with raised flat bed at the tip of cone filter, so that it prevent coffee ground stuck at the tip and add on bitterness to your cup. Mesh dimension is even and not easy to be deformed because the material is metal, and no chemical change occurs as a result. From the above reasons, it is little affected to the taste and flavors of coffee. And more, thanks to its unique longitudinal slot, the filter can provide a short brewing time at a very high temperature. 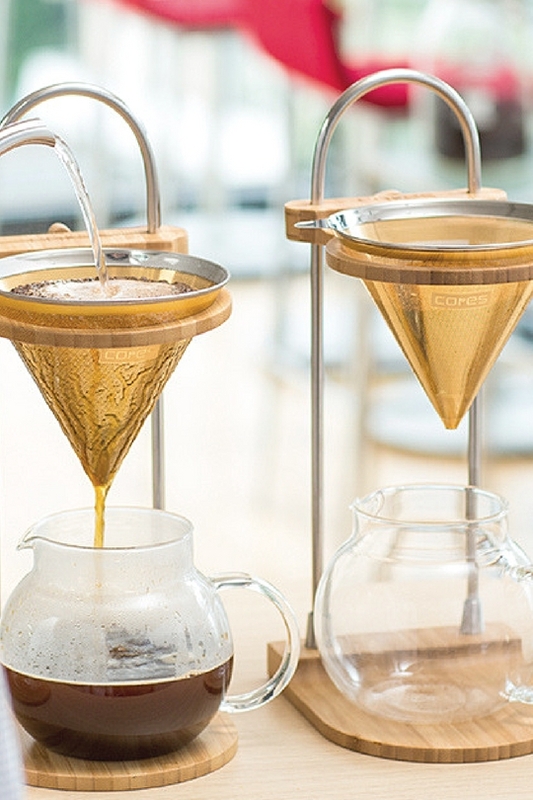 The gold coffee filter extracts coffee faster with more coffee oil, which enables to make a perfect cup of specialty coffees to enjoy their unique flavors and tastes. In a normal cone shaped filter, water flow tends to be gathered at the base of the filter. In order to prevent over extraction , the base of our cores cone filter is raised so the water flows outwards, and does not gather in the central lower area. Thanks to this raised base, strong bitterness does not come into the coffee liquid. C275 Gold Cone Filter can be used with its own brewing stand, or can be placed and brew with cone shaped brewer such as Chemex 6 cups, Hario V60 instead of using paper filter. You can compare the difference of flavor between paper and Gold filter, and choose the brew style depending on your feeling on the day. Interested in C275 Cone Filter stand? Cores Drip Stand designed for cone shaped filters is available. Fits C275GD perfectly.